T500 build-----It's on the ROAD!!! A fella could spend weeks browsing though all the stuff here on this site. What a resource. With my limited experience doing this sort of thing, and without spending a fortune, I'm hoping to end up with a decent looking cafe bike. Nothing crazy, and reuse as many of the original parts as possible. The hardest part is to teach myself patience. Brought it home, transferred the ownership into my name, and BEGAN the process of washing away what 20 years of sitting in a barn does to a bike. 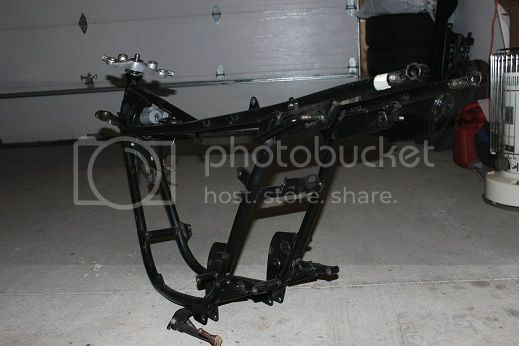 The frame now sits in the garage, stripped of all parts. Lots, omg......lots of work still to do. I'll throw the odd pic up here as I go, but I'm likely going to be learning way more than I'll ever be teaching!! That's a good looking machine despite the layers of crust and dust! 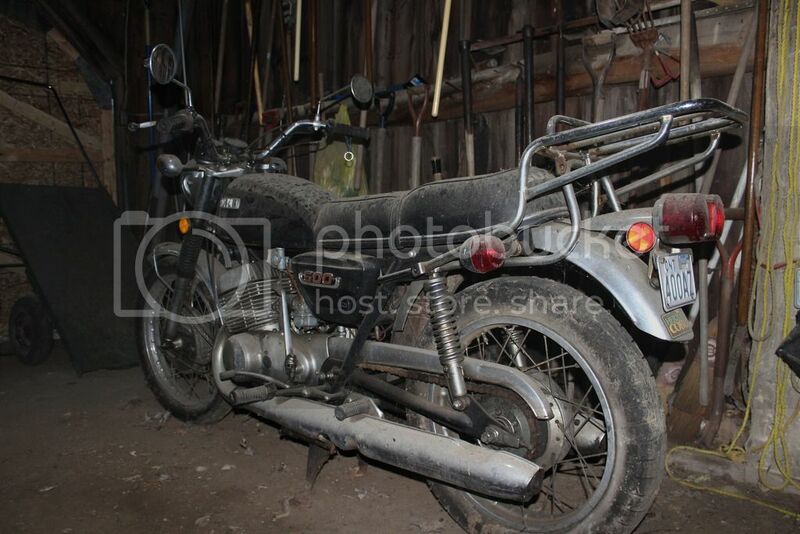 Whats your plan?...It's a good candidate for restoration IMO, but it's your bike. I restored a '67 about 15 years ago, it was a great machine and even though it was sold about five years later, I still miss it. Good sound looking bike you have there. Nicely dry stored. You'll bring in a good few pennies selling off the stock bits you don't need. It's good to see another stroker on here among the Hondas ! Keep the pictures coming, and give us an idea of what you are hoping to achieve. Nice T500 I agree with you about using as many of the original parts as you can. Do your Best,no one can take that from you. Thanks for the kind words so far. Plan? Well, already determined that fuel tank had been repaired previously both inside and out, and it leaks. Got an estimate, and it's almost in "new tank" pricing territory, so will be replacing the tank with something a little longer, and a little more "cafe-ish". Some of those fibreglass units look enticing, but I know they come with risks. 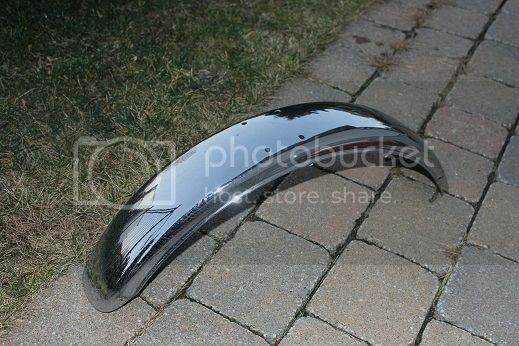 If anyone knows anyone with a roughly 24" long steel tank, let me know!!! No plans to upgrade/update suspension or brakes or frame...it won't necessarily be a back road/canyon thrasher, but that's OK. That's what my other bike is for. 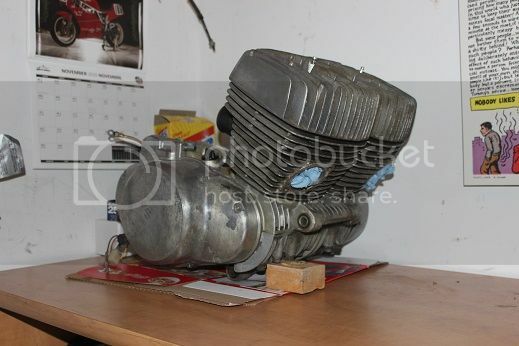 The big rock plan is clean it up as much as possible, new tank, solo seat (either the OEM seat reshaped (it's in amazing condition for its age) or a fibreglass unit), rearsets and clipons. Frame will get shaved of unnecessary brackets and repainted/powdercoated, and the tank/side panels will get some (hopefully) nice lustrous paint. Of course there will be new tires/shoes/chain/sprockets and other consumables. 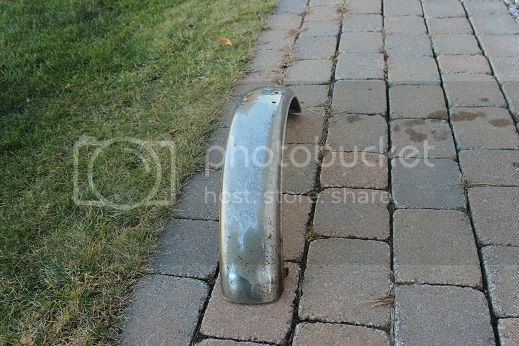 Exhaust pipes have some sctratches, so they may end up getting ceramic coated to cover those up, or if that's big money, well, I guess we'll have to be on the lookout for some chambers. Wheels will be disassembled and cleaned up, and rims perhaps powdercoated. But I have been pleased so far with the overall condition of the major components once they all got their first initial cleaning. For a while I wondered about restoring to original, and it likely is a great candidate for that, but I bought it to build a cafe bike, so that's what it'll be. If I do go the fibreglass seat route, yes...hoping someone snags the seat. Will also have handlebars (very clean) headlight ears (need some cleaning), rear fender/taillight assembly (in usable condition) and maybe some other parts that others might make use of. Hanging on to everything for the time being though----if there ends up being a $1000 repair surprise lurking in the engine, it might just turn back into a cleaned up basic T500. I know darn well that building something like this will require some money being spent, but there is a budget that I have to/want to stick to, so taking things on step at a time. I've had good success w/ a local powder coating company who did an excellent job doing high heat powder coating to my mufflers,I had my choice of colors too. I also had one done standard powder coat which was even cheaper and the coating has stayed on there no problem;even sitting in traffic for extended times it didn't do anything to discolor the standard PC.They put all the PC parts in the oven here and bake them at 435 degrees and our mufflers on the bikes never get that hot. Looks good. I wish you well with your build. my 70 model is about to get the refresh it deserves so it's always good to see how others are doing their builds. I am master of the learning plateau and a triumph of enthusiasm over experience. Not much to update. As "exciting" as it is for me to learn how to disassemble a 70's bike, it seems silly to flood this thread with pictures of bits and pieces. A tank has been acquired - from a '79 KZ400. It's currently getting cleaned up inside, and then the exterior needs some attention. Other than that, I've been busy with cleaning, cleaning, and more cleaning.